I'm so happy to be sharing a second look with you today from Honey Boutique in Toronto. Yesterday was all about the golden glam and today I wanted to share more of a casual style I've been wearing as of late. Despite the snow setting in the background, we've been experiencing above 0 temps which, if you know any Canadian gal, is reason enough to leave the heavy coat and socks behind for a day out on the town. Yep, we're crazy but we'll take what we can get! Not quite a blanket scarf, but this double-sided scarf is super thick which makes it a great layering item over this cropped sequin sweater. And of course the bling - this necklace is every-thang. I've even layered it with some gold chains for a more eclectic look but kept things more simplistic for today's look. As mentioned yesterday, if you haven't been to Honey as of late, be sure to check them out for all things gold, glitter, layering and fabulous for winter. Oh, I wish I'd look this stylish when it's cold and snowy outside!! Fantastic outfit, I like your shoes and scarf very much! Love the statement necklace with all the cozy clothes and of course, you can never go wrong with a pom pom!! Such a cute look. Loving that hat on you! I'm always looking for new beanies and I love this one! And I love the double-sided scarf! That reversible scarf is just about everything!! Love the layering and pom-pom hat! Love the layered look! The statement necklace is awesome! This is such a sweet look! Love the pop of red! And that hat, girly! Too sweet! I love this scarf! It's so bright and festive. These heels are lovely, too! You look adorable! Love this cozy look and the touch of leopard! i love this look! you pulled off casual and chic perfectly! 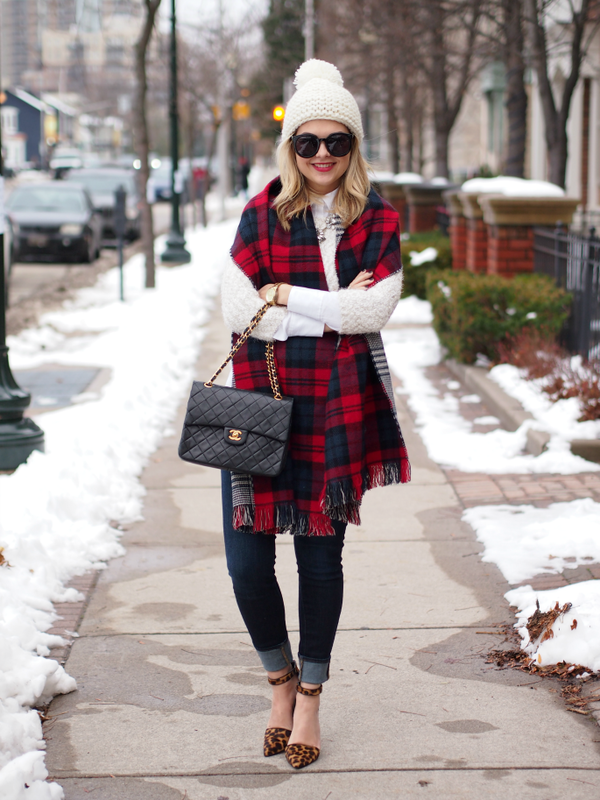 I think I need a red tartan scarf like that now! you look so cute! love that scarf!